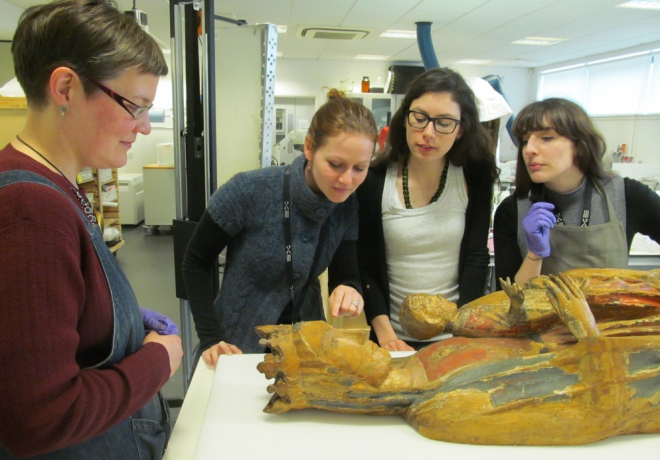 In March, our 14th-century Madonna and Child, on display from today in our new decorative art galleries, was the subject of a group discussion amongst the National Museums Scotland Artefact Conservation team. 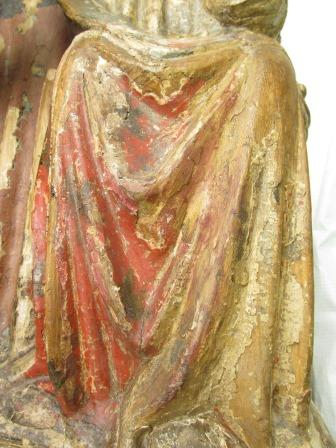 This beautiful carving presents considerable ethical challenges to the conservator and recently we were deliberating on the condition of the Madonna’s eyes and face. The Madonna has been repainted many times over the course of her existence since the original vibrant colour scheme. Repainting would have been for the benefit of worshippers in Italy when it was felt that the colours needed refreshing. We have been studying the paint layers to try to establish how many colour schemes can be identified and with which pigments she was repainted. 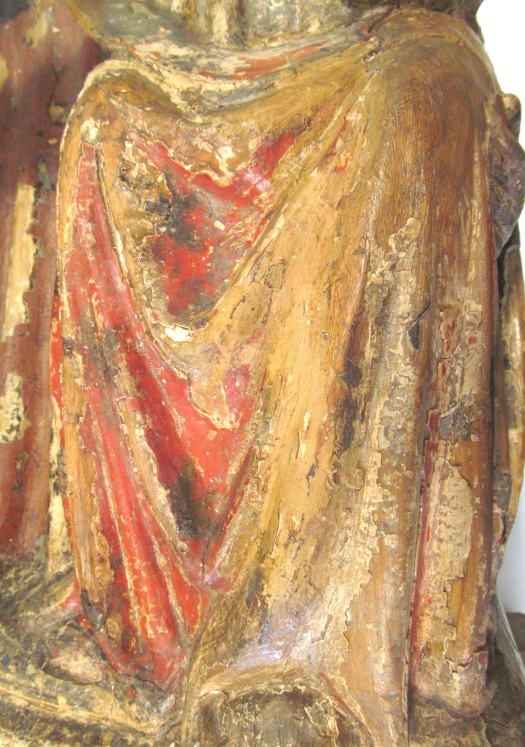 After her ‘use life’ in a church, it seems the paint layers degraded and flaked away in large areas, revealing the fine carving of the wood beneath. From this point, it would seem she was not repainted fully again though patches of repair were carried out. 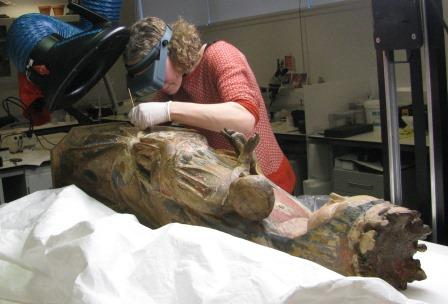 The sculpture was acquired by the museum in 1950 and the museum’s conservators carried out a major phase of repair. This was a time when today’s principles of conservation were beginning to be formalised, but ‘restoration’ rather than ‘conservation’ was more in vogue. The aim of the treatment was, on the one hand, to stabilise the remaining paint (as we would today) so that no more would be lost. But a second more controversial aim, so it would seem, was to ‘beautify’ the piece. Large areas were painted in. 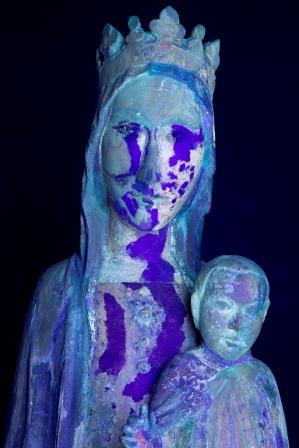 Our historic conservation records document the nature of the previous repair work but also very tellingly, we could see the extent of the work by looking at the statue under ultra-violet light. We use UV light to identify organic substances or differences in an object not visible to the naked eye. Surface coatings such as varnishes and some paints fluoresce under UV light in various colours. Ivory, for example, generally fluoresces bright white which can be helpful when identifying genuine ivory over a synthetic imitation. When we used this technique on the Madonna, the results were startling. The very dark purple-blue areas we know to be the retouching carried out at the museum in the 1960s and this had clearly included defining the shape of the Madonna’s eyes, as well as overpainting large areas on her face and chest. A major part of my work on the piece has been to remove many other areas of repair which we know were made at the museum in the 1960s. 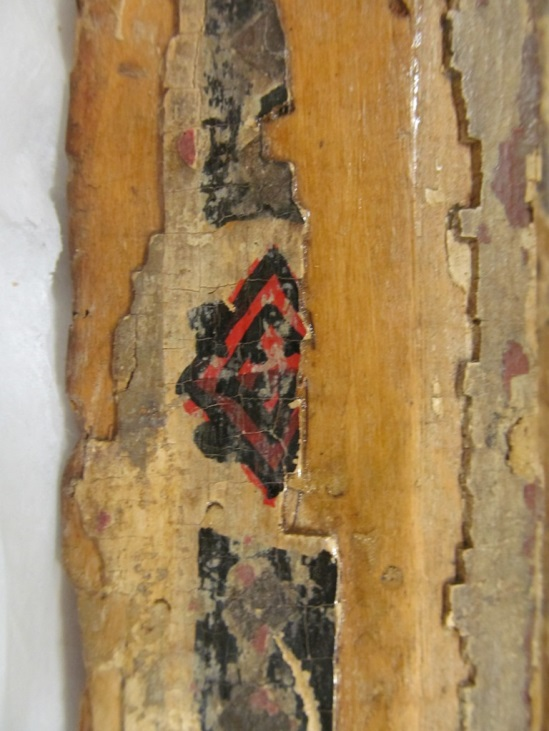 This was for three reasons: they were not necessary for the stability of the piece; the materials used were likely to be reaching a point when they would start to degrade; and finally, it was felt that the repairs obscured the older paint layers and made the piece harder to read. However, could and should the same principles be applied to such a prominent area as the face and particularly the eyes? This was the subject of our group discussion. The general feeling was that to be consistent with the other removals, the 1960s in-painting should be removed. 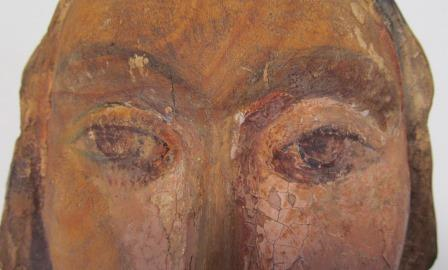 It was also possible that we would find remnants of the original eyes beneath the in-painting. However, there was no way to be sure of this. 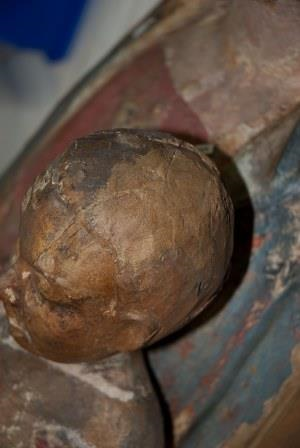 In general, in conservation we try to interfere as little as possible with an object. Removal of the face and chest overpainting would amount to considerable intervention. It would leave the Madonna with a very different appearance. Ethically, the arguments were strong for the removal of something we knew was not historically accurate and was potentially obscuring a true reading of the piece. However, there was the more emotional response to consider: would she still be considered beautiful? Would she still hold the gaze when she might have no eyes to hold it with? Would she lose her appeal and therefore the public’s interest? In that case, was such a step doing the statue a disservice? This kind of decision always needs to be a group one. After the conservators’ discussion, I wished to discuss this proposed treatment strategy with the rest of the Madonna project team: Rachel King, our curator, Lore Troalen, our conservation scientist, and Luca Palozzi, an art historian from Edinburgh University. Would there be a different art historical and curatorial perspective? Find out what the final conclusion was to be in the coming months! 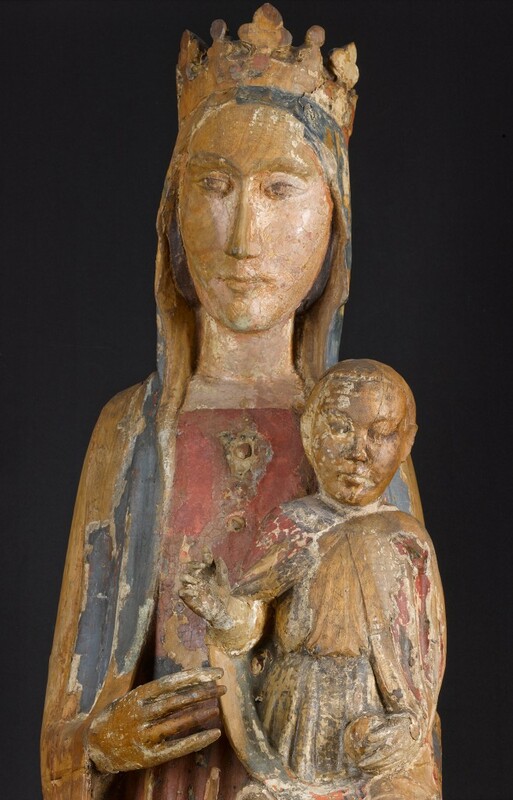 Research and conservation of the Madonna are supported by a Museums and Exhibitions Grant from the Association of Art Historians and monies from The Henry Moore Foundation.